Join PSD on May 6th, 2014 from 1:00-2:00pm EDT for a LIVE demonstration of the most exciting new features in OpenStudio v1.3.0. As a licensed OpenStudio training and support organization, PSD is offering this webinar to raise awareness of the potential power of OpenStudio. The webinar will be led by PSD’s Vice President of Research and Development, Chris Balbach. OpenStudio 1.3.0 introduces drag, drop and configuration capabilities to model the energy use of common commercial refrigeration systems (e.g. display cases and walk in coolers), including cascading systems. While this is not unique, the ability to integrate the energy impacts of refrigeration systems into a building’s heat balance at an adjustable sub-hourly time step provides tightly coupled feedback for estimating the interactions between energy systems. OpenStudio provides drag, drop and configure capabilities for modeling VRF (Variable Flow Refrigerant) HVAC systems and controls of varying complexity. VRF systems can be configured to operate in either a ‘heat pump’ mode, (where the system operates in either heating or cooling mode) or in a heat recovery mode (where indoor units can recover and exchange heat with other indoor units operating in the opposite mode). In addition, the outdoor units can be configured to be air, water or evaporative cooled. User defined performance curves (generated from manufacturers published performance data) can now be used to describe equipment performance. Forced Air HVAC systems commonly use plenums for supplying and/or returning the conditioned air. This release of OpenStudio allows users to define and configure supply and return plenums that serve multiple conditioned zones. Plenums are considered unconditioned thermal zones and are composed of children OpenStudio spaces. The plenum zones can leverage OpenStudio’s space type definitions for rapid object and property assignments. 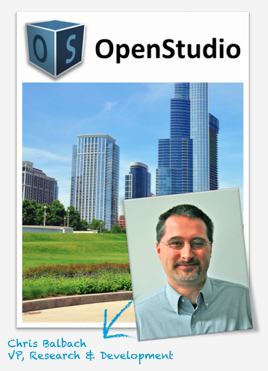 Join PSD on July 16th, 2014 from 1:00-2:00pm EDT for a FREE LIVE demonstration and introduction to OpenStudio. PSD is offering this webinar to raise awareness of the suite of tools available with OpenStudio. The webinar will be led by PSD’s Vice President of Research and Development, Chris Balbach. Join us for a LIVE demonstration of the most exciting new features in OpenStudio v1.4.0. As a licensed OpenStudio training and support organization, PSD is offering this webinar to raise awareness of the potential power of OpenStudio. The webinar will be led by PSD’s Vice President of Research and Development, Chris Balbach. This course will introduce two important and powerful topics that can be explored using the OpenStudio ecosystem – authoring of custom ‘measures’ and the numerical quantification of simulation related uncertainties. Participants will learn the fundamentals of OpenStudio measure authoring, and will gain an understanding of how the flexible OpenStudio architecture can be manipulated to accomplish simulation goals. Methods for using OpenStudio tools to determine simulation related uncertainty will be shared, along with examples studies.